To begin, the students and I discussed ways to figure out unknown words in text. 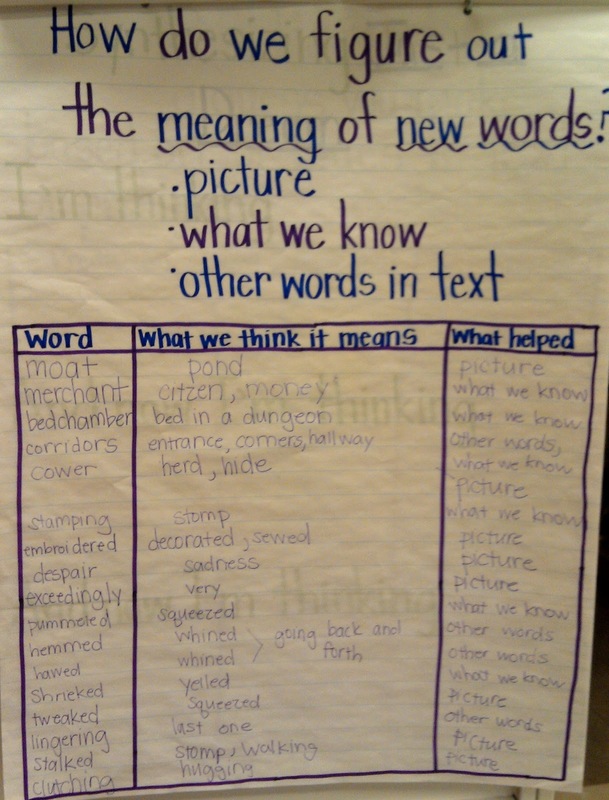 We came up with the following: use the pictures, what we already know, and other words in the text. I recorded these ideas on our anchor chart. 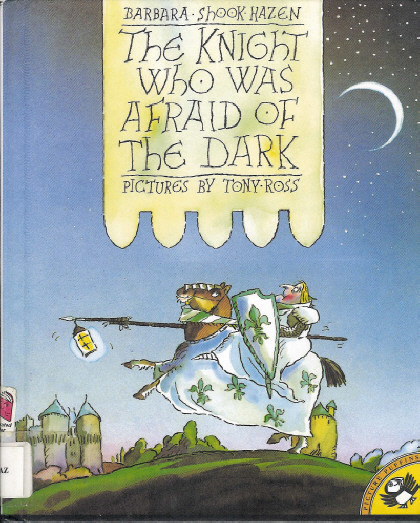 Then, I read aloud the book The Knight Who Was Afraid of the Dark. This book is full of wonderful, descriptive words for students to infer with. It is also very funny, which the kids really enjoy. As we read, we identified unknown words in the text and added these to our anchor chart. We inferred the meaning of these words and identified what clues we used to infer. The students correctly inferred the meanings of most of the words. The following day, we began reading The Singing Man. This book contains many great words for students to infer with. Students independently read a few pages and identified unknown words. 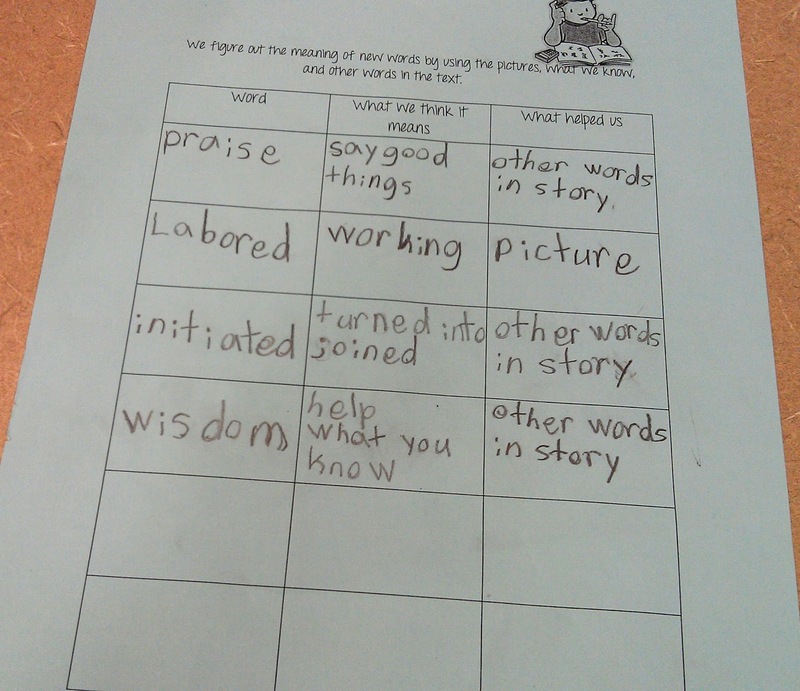 They used the graphic organizer below to infer the meanings of these words. Then we discussed the text and students' inferences together. For independent practice, students read the short story "Just a Girl." (found at www.infohio.org) This story describes how a young girl in Yemen proves to her father that she deserves to attend school. Students completed the graphic organizer to infer the meaning of unknown words independently with this story. Great questions! I have tried both blogger and wordpress. I like how blogger is configured with google. I think it is good to start out with a free platform, and if you feel limited, then go for a paid platform. Feel free to ask anymore questions!